Concerned that having just arrived back from 2 months of completely new and very interesting experiences and activity in Greece I am determined that I do not want to slip back into old habits. I need to inject new challenge into the daily routine, drive out the greyness from the brain. So I decided to go ‘Up North’ for the weekend to stay with my daughter and her husband near Manchester. 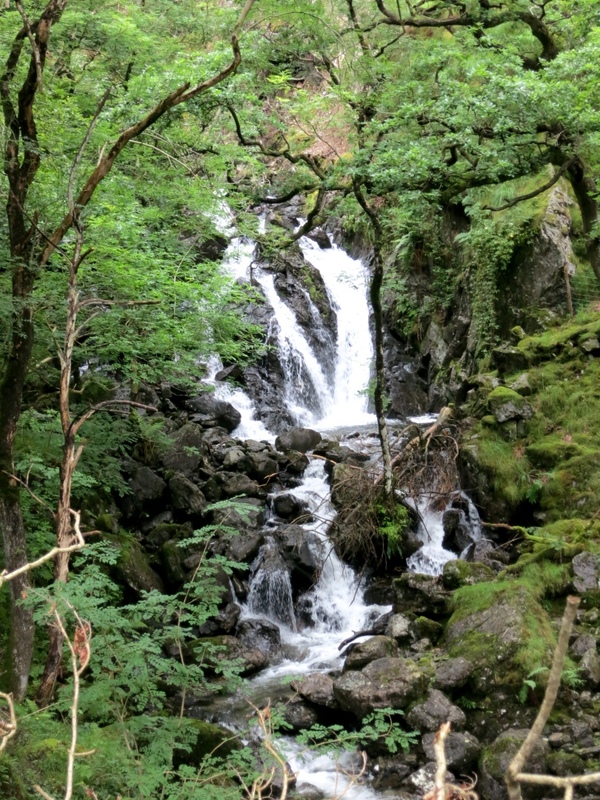 But, crucially, I decided that as part of that trip, rather than the usual route up the tedious motorway traffic congestion of the M5/M6, I would go via Mid Wales and Cadair Idris. 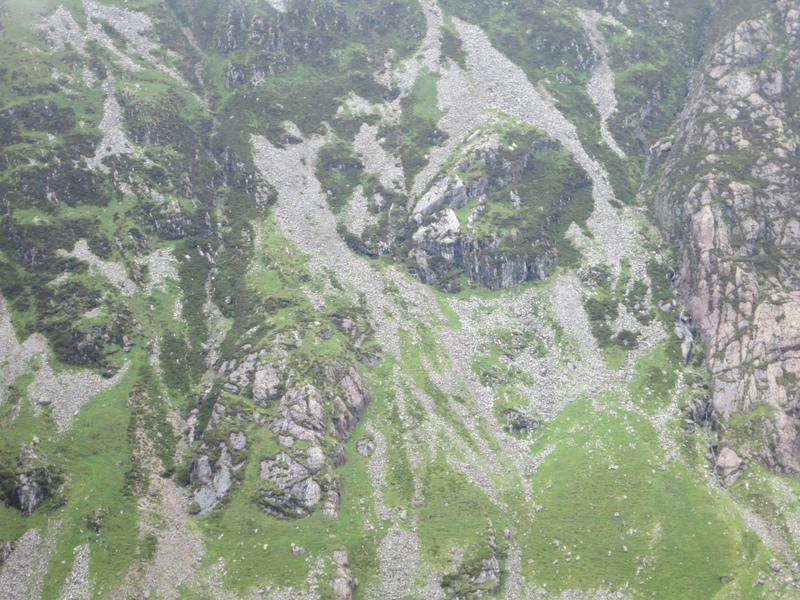 Cadair Idris is the southernmost peak in the Snowdonia National Park. At 893 metres (2,930 feet) it is not the highest peak in Wales, that distinction goes to Yr Wyddfa (Snowdon) at 1085 metres (3,560 feet). But Cadair is a mountaineers mountain. Snowdon is totally prostituted by having a railway to the summit, a newly redeveloped café on the top and myriads of tourists many of whom tackle it completely ill-equipped and lacking in mountain experience. Cadair Idris certainly attracts many visitors, particularly in summer months, but the vast majority are experienced walkers or mountaineers. It is also a serious undertaking for two reasons. 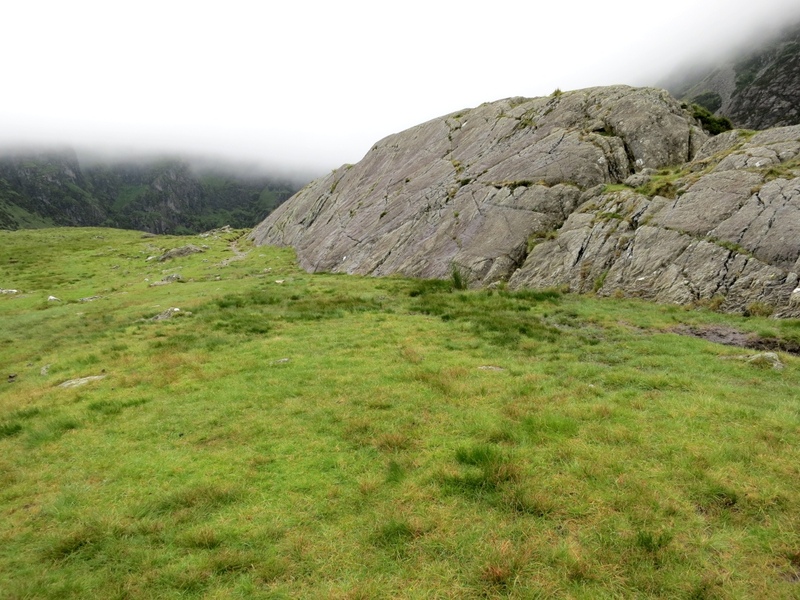 First, when tackled from the south side the start point is close to sea level, unlike most ascents of Snowdon which start at significantly higher altitudes. Second, horizontally the summit is very close to the start point …. so it’s a very steep and demanding ascent. I was introduced to the mountain in my first year in university on a field trip to look at the classic glacial erosion features such as cwms, moraines, striated rocks, and roches moutonnées. I have loved the mountain ever since and climbed it many times but not in recent years. I like it especially in winter and took to only going up there when it was encased in snow and ice. I have been on top when it was so cold that my sandwiches froze before I could finish eating them. Then a turning point. About 10 years ago I drove up there for a day’s climbing in winter and bought a new ice-axe on the way which action triggered a succession of very mild winters. The only hard winter in recent years was when I was in Canada. No fear of snow and ice this time, just grey and wet. Better weather would certainly have helped but was not forecast. Instead the forecast for Friday’s weather improved from weather-warning torrential rain (forecast on Tuesday) to light rain (forecast Thursday) to cloudy but dry (Friday morning). I was determined to do the climb whatever the weather so I packed my bags, sorted out wet weather gear sufficient for any eventuality, and headed North. Digression. For two months in Greece I travelled by bus and train. I was therefore obliged by practicality to ‘pack light’ and was used to thinking which items of clothing would cover most eventualities. Travelling by car I could just chuck as much as I wanted in the back. A completely different mind-set and a little unnerving as the frugal-packing habit was deeply ingrained. In the end I threw in a few extras ‘just in case’: extra pair of walking trousers, extra shoes, two cags ….. End of digression. I had driven much of the route up North hundreds of times but not for some years and layers of other memories obscured it. Though as I set out the I couldn’t remember the way, recollections came back as I progressed northwards: Abergavenny, Talgarth, Builth Wells, Rhayader, Llangurig and then eastwards to Lanidloes before north again to Machynleth and the final leg to Minfordd at the foot of the mountain. Even when I’m at home I go most places by bus, leaving the car in the garage except for a few local trips, so I was a little apprehensive about once again driving longer distances on narrow winding roads. However all went well and I arrived in the car park at 13.00, 2½ hours after setting off. I was going up the Minfordd Path as far as the corrie lake of Llyn Cau surrounded by a dramatic amphitheatre of towering cliffs. Still relatively fit from walking in the Pindus and Taygetos Mountains I got to the lake in 45 minutes and was well pleased, this was certainly banishing the grey from the brain. 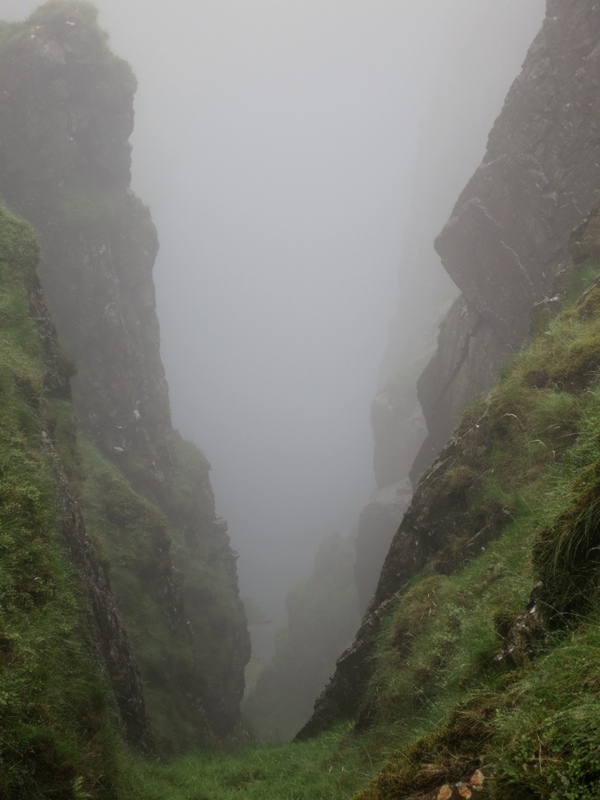 Ironic really given that the serrated rim of cliffs surrounding the lake was completely lost in thick, grey cloud. I guessed the peaks were still up there because I had seen them, and photographed them, so often in the past. Much of the next stage of the climb would be lost in greyness. 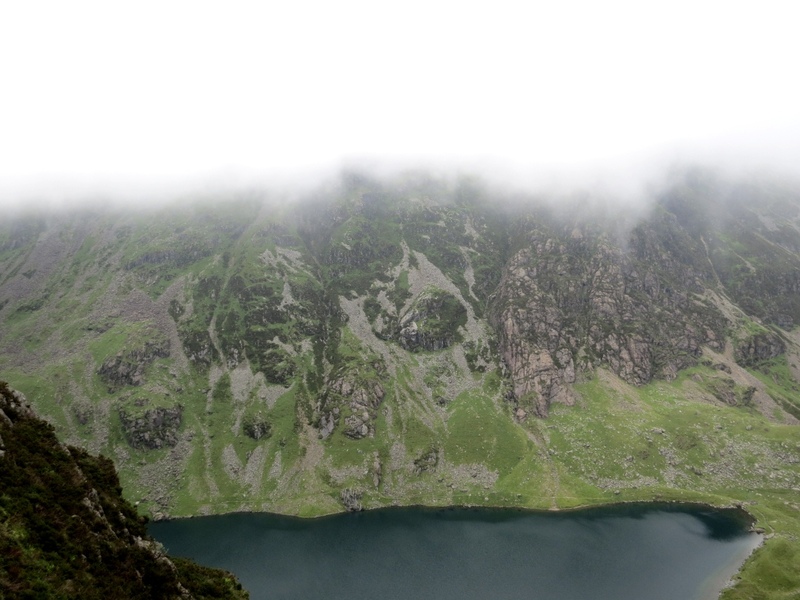 The plan was to leave the path at the lake and climb up one of the steep gullies in the back wall of the corrie. 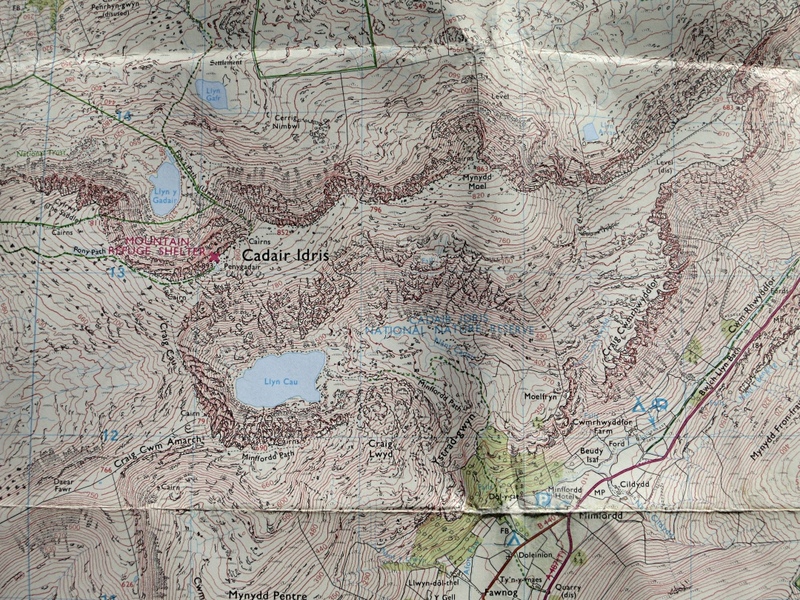 Maps are no use in situations like this because the contours are so tightly packed and are in any case obscured by ‘cliff’ symbols. 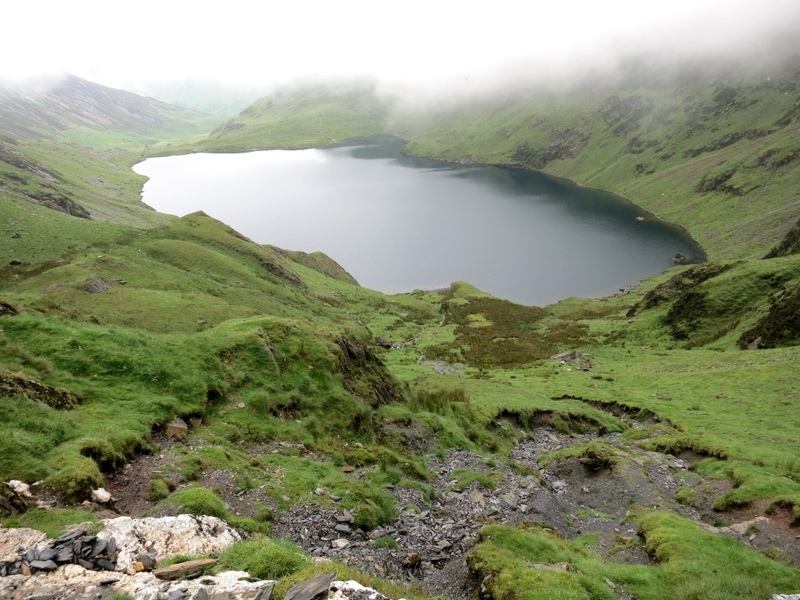 It was a matter of going around the edge of the lake and then striking up into the gully which I knew could be followed increasingly steeply upwards to a point in the col between the main summit of Penygadair and Craig Cau. In winter the top of the gully is overhung by a snow cornice which necessitates going off to the side to find a point where it can be breached safely with an ice axe but on Friday it could be followed to its top. 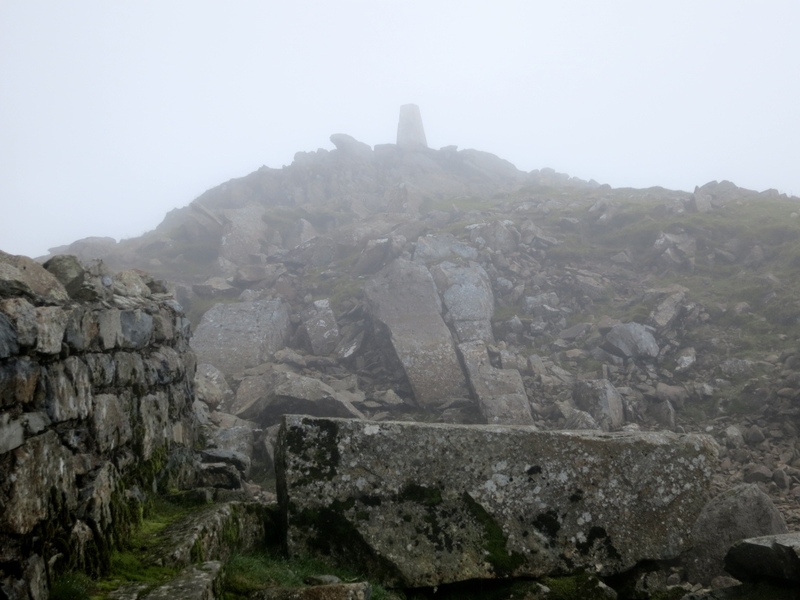 Then it was a simple matter climbing out of the gully to rejoin the Minfordd Path and following it to the summit, aided in the thick cloud by giant stone cairns which had been heaped up by generations of walkers. In good visibility these cairns seem overkill but in poor visibility they mark the way ahead as the route meanders over the rocky ground. It took just over 1½ hours to the top from the car park. Short banana break in the mountain refuge on the top and then time to head back down, this time keeping to the Minfordd Path all the way as it follows the horseshoe of cliffs around the corrie lake far below. 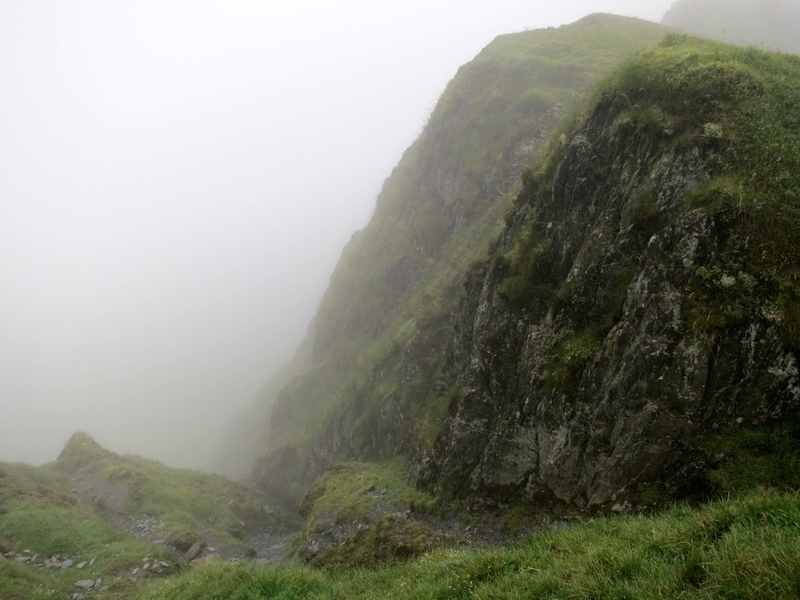 It is always more dangerous going down than up steep slopes and, with the cloud cover making the rock very wet and slippery, going back down the gully seemed a risk too far. I must admit to a certain euphoria coming off the summit and I started to bounce down the rocks. Until I took a bit of a tumble and popped one of the cartilages in my ribs. Minor discomfort but nothing could detract from the joy of being up there. I had the mountain entirely to myself. I was well chuffed. I was surrounded by thick grey cloud but the grey had been banished from my brain. At the top of the gully which I climbed up into the col. 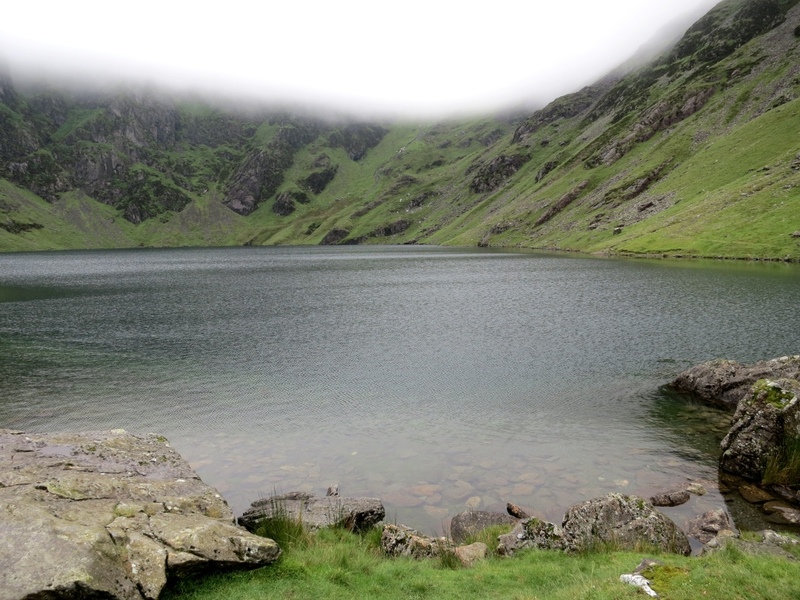 This entry was posted in Grey Britain and tagged Cadair Idris, Llyn Cau, Snowdonia. Bookmark the permalink.